"Sure, everyone knows orange-fleshed sweet potatoes aren't really yams, but it makes for a shorter name. 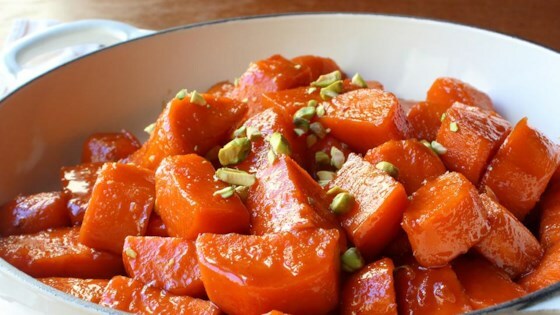 I'm not a huge sweet side dish person, but I make an exception for these candied yams that use lemon instead of orange juice as a sweetener." Stir salt into 2 quarts cold water in a large pot. Transfer sweet potato pieces to pot and place over high heat; bring to a simmer. Reduce heat to medium-low and simmer until potatoes are not quite tender but still cooked, 5 to 7 minutes. Use the tip of a knife to test for doneness. Drain. Place brown sugar, butter, lemon juice, maple syrup, ginger, cinnamon, cayenne, and pinch of salt in a skillet. Place over medium-high heat, stirring until glaze ingredients melt and start bubbling. Continue cooking, stirring occasionally, until mixture begins to thicken up, 4 to 6 minutes. Transfer drained sweet potatoes to skillet. Raise heat to high and cook and stir until potatoes are coated with glaze and very tender, and glaze has thickened, 5 to 8 minutes. Transfer to serving dish; garnish with chopped nuts. If you're using fine salt instead of kosher salt, use about 5 teaspoons fine salt instead of 3 tablespoons of kosher salt. We really liked this recipe, but too much lemon. It overpowered everything. I would add and taste, repeat, next time. Love this recipe. Only thing I would change is the lemon juice. The next time I’ll use less and add a little at a time. My nieces also loved it. Will definitely make again. Served his at “FriendsGiving” and everyone liked them. But I agree with another reviewer that it was too much lemon juice,. I’ll try it again using half the amount. Fun to make an it was great!